There are a few new reports on the U.S. economy worth mentioning this morning. 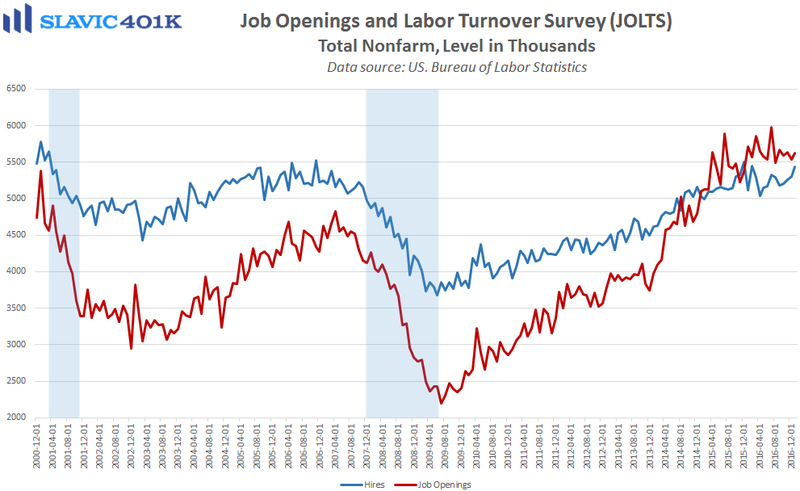 First, the latest job openings and labor turnover survey (JOLTS) from the Bureau of Labor Statistics, one of Federal Reserve Chair Janet Yellen’s favorite economic indicators, showed that there were 5.626 million job openings in America in January (lagged release). That was an increase from December’s upward-revised 5.539 million print and better than expected, although slightly below the monthly average in 2016 (5.648 million). Total hires rose in January to 5.440 million, the fourth monthly improvement in a row and the best print since February of last year. The stronger hires figure was not too surprising since nonfarm payrolls jumped in January, and annual growth that same month climbed to the fastest pace in almost a year. 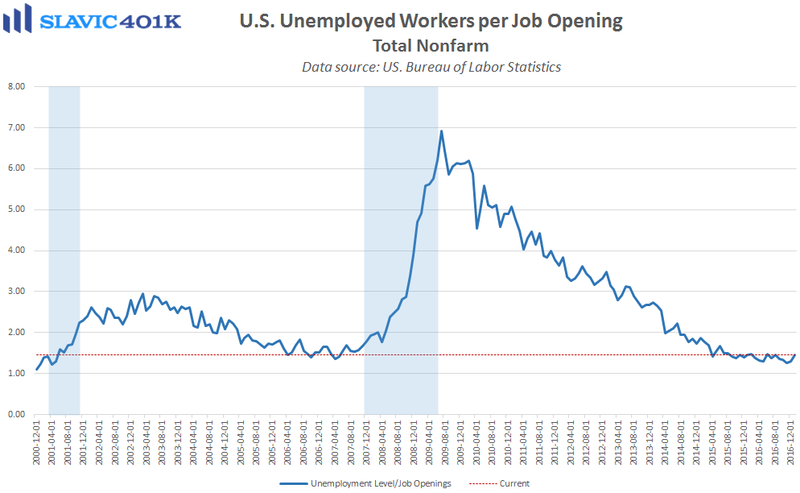 Elsewhere in the report, the number of unemployed Americans per job opening ended January at 1.45, the worst reading since August but still historically low. 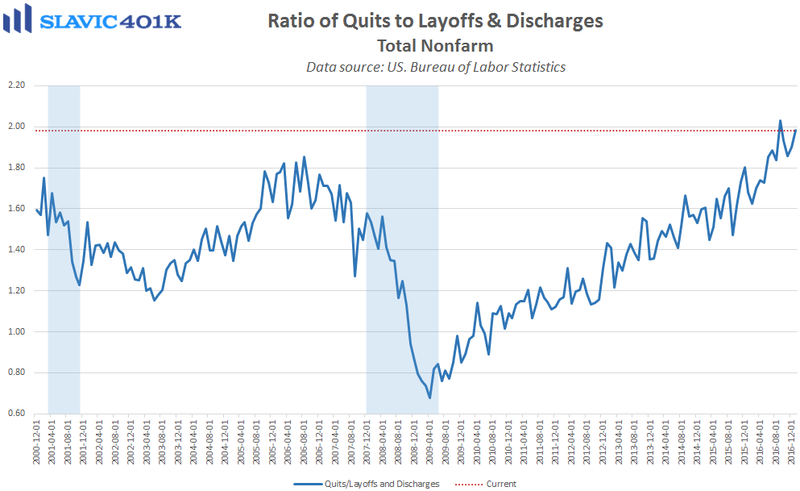 More encouraging was the quits rate, which climbed to a recovery high in January, and the ratio of quits to layoffs and discharges rose to 1.98, the second-best reading since the turn of the century. Those last two figures provide more evidence of U.S. workers’ increased willingness to give up their current job security for better employment opportunities. 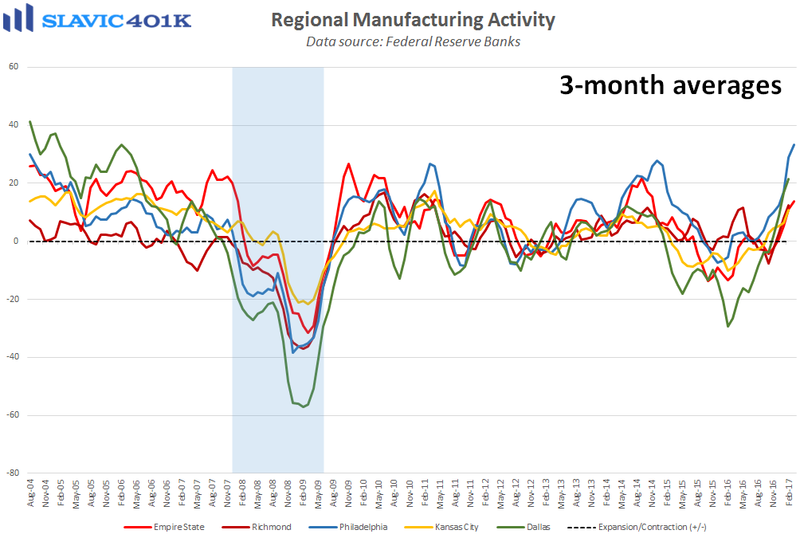 Next, data from the Federal Reserve Bank of Philadelphia showed that manufacturing activity in the Mid-Atlantic region of the country cooled this month, as the general business conditions index fell from +43.3 to +32.8. That was the first decline since the election but a smaller pullback than expected following the 3-decade high hit in February and still the best headline reading since November 2014. Current measures of new orders, shipments, inventories, total employment, and hours worked all improved in March but prices paid surged (input cost inflation), suggesting additional margin strain for manufacturers. Forward-looking indicators (six months ahead) generally remained positive this month, and reported capital expenditure plans continued to increase. 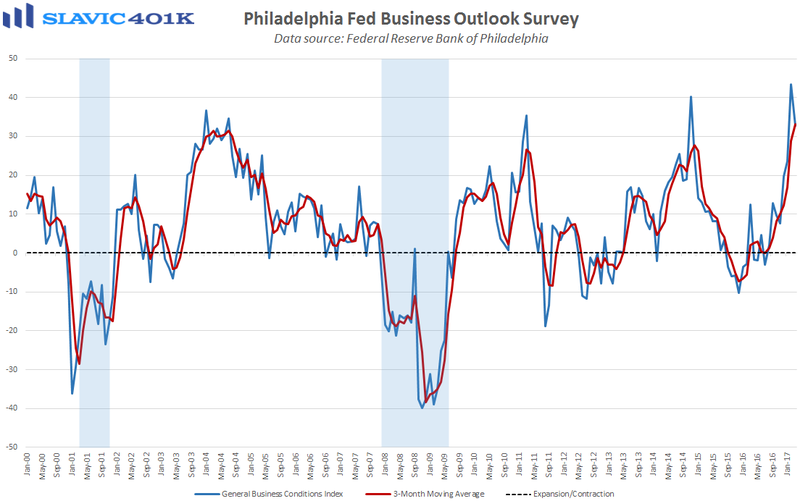 Business managers in the March survey were also asked a few special questions about employment conditions, and the percentages of respondents complaining about labor shortages, skills mismatches, and lengthy job vacancies have all increased considerably compared to earlier surveys. 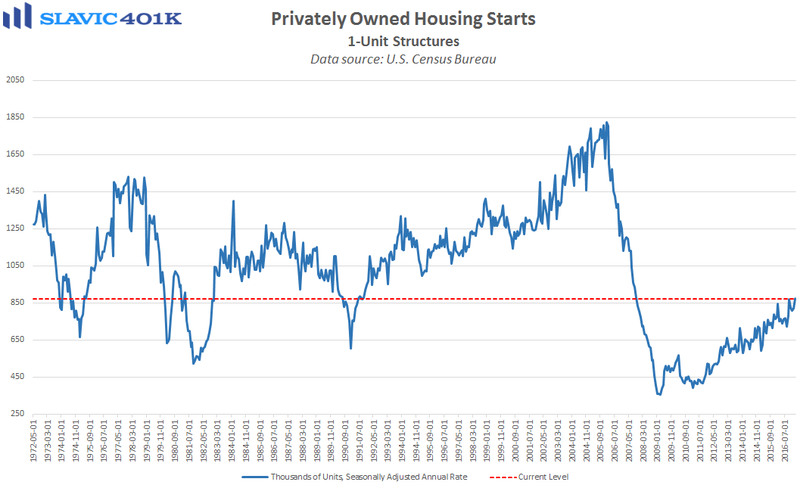 Elsewhere, a report from the U.S. Census Bureau showed that privately-owned housing starts in February grew at a seasonally adjusted annual rate (SAAR) of 1.288 million units. That was a 3.0 percent increase from January’s upward-revised print and better than economists had anticipated. 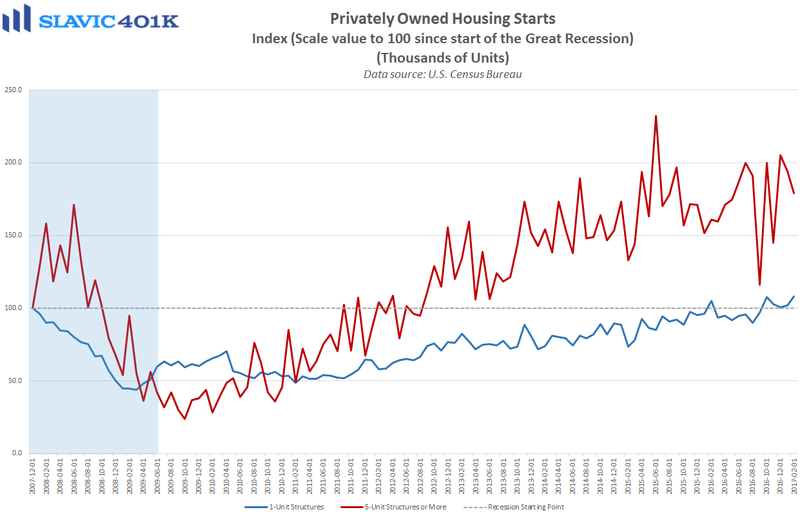 Starts of multi-family units (rentals) fell by 7.7 percent in February, while single-family housing starts encouragingly rose by 6.5 percent to a new cycle high. 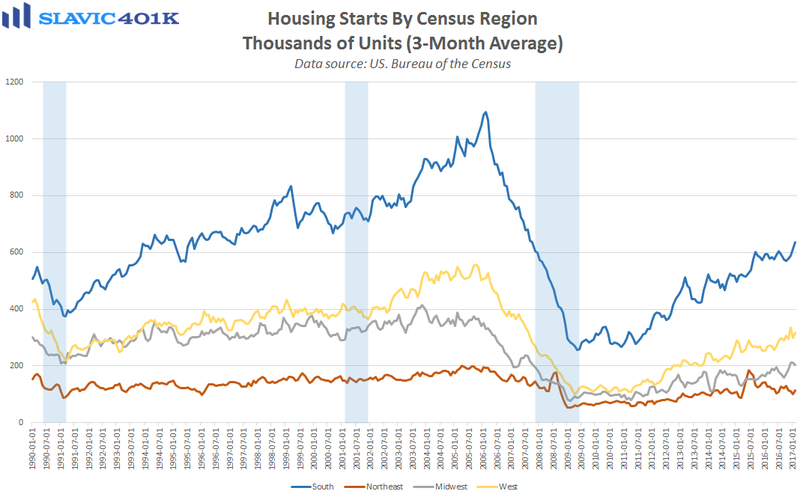 Regionally, housing starts decreased in the South (-3.8%), the Midwest (-4.6%), and the Northeast (-9.8%) last month but surged out West (+35.7%). Total building permits, a popular gauge of future construction activity, fell 6.2 percent last month, worse than expected but due mainly to a 26.9 percent plunge in rental authorizations, while single-family permits lifted by a healthy 3.1 percent.